On the North and Northeast. A line from Tanjong Dehekolano, the Eastern extreme of the Soela [Sula] Islands to the Western extreme of Obi, along its Southern coast to Tanjung Serammaloleo its Eastern extreme, thence through Tobalai, Kekeh, Pisang and Kofiau Islands to Tanjong Sele (1°26′S 130°55′E﻿ / ﻿1.433°S 130.917°E﻿ / -1.433; 130.917), the Western point of New Guinea, down the coast to Karufa (3°51.5′S 133°27′E﻿ / ﻿3.8583°S 133.450°E﻿ / -3.8583; 133.450). On the Southeast. A line from Karufa, New Guinea, to the Southeastern extreme of pulau Adi, thence to tanjung Borang, the Northern point of pulau Nuhuyut [Kai Besar] (5°17′S 133°09′E﻿ / ﻿5.283°S 133.150°E﻿ / -5.283; 133.150). On the West. 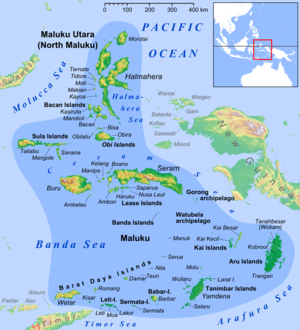 A line from Tanjung Palpetu to Tanjung Waka, the Southern point of pulau Sanana, through this island to its Northern point, thence across the Mangoli Strait to the South coast of Mangole (Sula Islands) in [1°56′S 125°55′E﻿ / ﻿1.933°S 125.917°E﻿ / -1.933; 125.917]. This page was last edited on 8 September 2018, at 07:04 (UTC).